la@georgebillis.com 310 838 3685 2716 S. La Cienega Blvd. George Billis Gallery, L.A. will exhibit paintings and mixed media works by Julie Speed, Ellen Frances Tuchman and Richard Orient, The exhibition will run from March 7 through April 8, 2006. A reception for the artists will be held at the gallery on Saturday, March 11 from 5–8p.m. Hailed as one of Texas’ premier contemporary artists, Julie Speed will be exhibiting new works in Los Angeles for the first time in over ten years. With artwork hanging in major museum collections, and an exhibition history that spans the nation, Ms. Speed is revered for both her exacting skill as an artist and the off-beat, often bizarre nature of her imagery. is largely self-taught. An amazing feat when one considers the oft-heard comparison of her work to that of the Old Masters. Born in Chicago and raised mostly on the East Coast, Speed moved to Austin in the late 1970’s. After a period of travel and intermittent employment she decided to devote herself full time to working in her studio and teaching herself to paint. 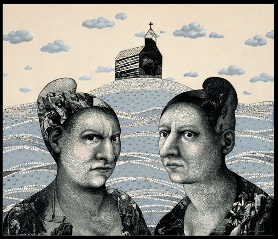 Her most recent series, titled ‘Bible Studies’ combine Speed’s love of antique engravings and collage elements with images reminiscent of early Italian Renaissance painters. Each work on paper, though an edition, is unique unto itself with gouache and ink after printing treatments. Many of the pieces in the series feature cut-out illustrations from an 1877 Gustav Dore Swedish bible that was destroyed in a flood. The viewer can also find bits and pieces of archaic medical books and patent catalogues buried in the stoic profiles and harried glances of her uniquely surrealist portraits. A Los Angeles native, now living in Texas, artist Ellen Frances Tuchman creates mixed media pieces that transcend their roots in the patterning and decoration movement of the early 1980’s. Each work is an amalgam of beads, ribbons, buttons and threads set on a background of vellum with painterly finishes. Echoes of topography and circuitry lie within Tuchman’s modernist grids that play upon our transitory and sensory memory. Tuchman explains, As a child, I deeply loved the Ice Capades and circus costumes. Spectacle. Color. General exuberance. A joy of surface. I am haunted by the mirrored house I saw at LACMA and Disney’s “Alice in Wonderland” ride, with its screwy-colored flora. Tuchman’s work has been exhibited nationally for over two decades, and has garnered critical praise from notable publications including the Los Angeles Times. Her work resides in numerous corporate and private collections. Ms. Tuchman received a Bachelor of Fine Arts from the California College of Arts and Crafts. For his new abstract series of paintings, Richard Orient employs a technique whereby he coaxes the liquid paint onto the surface, both paper and rubber, in a controlled motion, resulting in shapes that resemble waveforms. The translucent forms reveal the history of layers beneath, giving the work a strong sense of depth and movement. becomes the wave and these panels are the record of frequency and flow. paint. It’s an action painting of sorts, with an even, yet uncontrolled, rhythm.